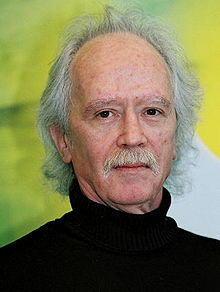 John Howard Carpenter (January 16, 1948 –) is an American film director, screenwriter, producer, musician, editor and composer. I staggered through my career and came out the other end, alive. I made some films that meant something to me. In my opinion, they weren’t all great, and they weren’t all successful, but they sure were ‘me’. And this is what I was going through or thinking or feeling as a director at the time, and I’m very proud of them. A lot of great directors just never had the chance to have their work appreciated and celebrated and watched, all these years after they were made. So, man, what do you want out of life? It’s great! There were two times in my life that inspired me the most. The first was when I was a kid, probably the most emotionally influential time, when you’re naïve and innocent. I went to movie theaters and fell in love with genre films in the 1950s, when there was a big wave of monster movies. My passion came from the young guy who was watching The Fly back in 1958. Then, going to USC I began to watch movies in a different way and was exposed to different kinds of movies, foreign films. We had directors like Orson Welles, Alfred Hitchcock, Howard Hawks and John Ford come down and lecture us. It was unbelievable!